You are here: Home / Facts / Clean Your Espresso Machine? Why, How and When? Most of the coffee shops everywhere do not devote much of their time for maintaining the additions of their shops such as the espresso machine or the coffee grinder. The fact is that cleaning the espresso machine is just a 10 minutes job and if done with efficiency, it can certainly pay you off as it will satisfy the customers besides improving the service life of your machine. 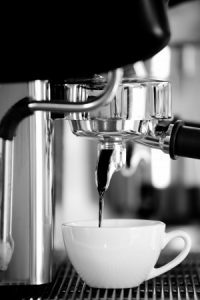 Cleaning an espresso machine can seem to be a very daunting challenge, but to reap the reward of customer satisfaction you will need to put in some efforts. Mentioned below are some steps which can be very useful for you as you take a break from your commercial activities and get on to clean a commercial espresso machine. When you start the cleaning process, you should begin by taking a clean lint free cloth. Rinse the cloth with hot water and then use it to wipe off the steam wands. The basic purpose here to do this is to remove all the stains as well as the stickiness from the wands. However, you should be careful to not use a sharp tool for scraping off anything because doing so can result in some ugly looking and permanent scratches. If you notice the wand being threaded, then you can easily unscrew it and follow it up by giving it a thorough and deep wash.
You can use a thin wire if needed to clean the inside of the tip. Thereafter, you need to fill a small bucket with hot water up to 3 inches. After that, you will have to pour few drops of a commercial espresso machine cleaning fluid, which is easily available in the market. Now, you can soak all the parts in this fluid overnight. After that, you will have to take out the filter basket, for which you can use a screwdriver. You can clean the filter basket under some running water or by keeping it under a tap. If required, then you can also use some soap in it to make it look cleaner. Now, you will need to put the basket back into the bucket solution. Keep it inside the solution for an overnight soak. After that, you should add commercial espresso cleaning fluid, half a teaspoon to be exact, inside a blind filter. Follow it up by locking the group handle. You can use the manual override button for flushing all the water which is remaining inside this group head. Due to this, the cleaner will begin back washing directly into the machine and as a result it will also get de-scaled. But one point you need to take notice of is that you should not turn on the water. Doing this can burn out the solenoid of the machine, which is the part responsible for operating of the valve. Instead of this, what you should do is just hold the override button for around 3 to 5 seconds, and then turn it off. Repeat it again and again for around 10 times. The next thing which you will be required to do after that will be to turn the espresso machine off in order to open up the steam wands. This needs to be done to purge all the steam as well as to fully de-pressurize it. After that, you can just leave it open for a time of around 8 to 10 hours. Inside the group head, there are some shower heads which are clearly visible when you look into the group head. You will also be able to see a small screw which will be holding the shower screen along with a brass plate. You need to unscrew the plate as well as the screen which is quite easy to do. Make use of scouring pad and scrub both the plate as well as the screen and then add them to the bucket which you had prepared earlier. The gratings which will be connected to the drip tray will need to be pulled out for the purpose of draining them. You should thereafter clean the drip tray along with the gratings. They must be left to dry overnight after they are thoroughly cleaned. But then, you should absolutely make sure that you do not put them back into the machine before they are 100% completely dry. Putting them back without drying them completely can hazardous effects on the machine’s functionality and hence you need to to take extra care so as to ensure that the parts are completely dry. In the end, after you have put each and every part back together into the machine, you can use a few paper towels in order to buff the machine itself. This will make your machine shine as if it is a new one and it will also make it to function absolutely perfectly. Hence, you now know that if you start with the cleaning process of your commercial espresso machine, then it will not take much time. Just by following the steps which are mentioned above, you can give your machine a thorough clean out which will make it look and work fine. This will satisfy the customers who visit you business and also prolong the life of the machine, making sure that the investment which you have made lasts for years to come.